Asking Markets to Do What They Do Poorly — School Reform | Daniel Katz, Ph.D. The purpose of school, therefore, is to provide a forum where any person, regardless of personal circumstance, can fairly demonstrate both potential and accomplishment. Schools, philosophically, are meant to drive opportunity that we do not provide via leveling the distribution of resources. That is a weighty mission, and it resonates with certain themes that are popular among American society such as the absence of a titular aristocracy and the belief that merit is properly recognized and rewarded. Getting Americans to agree on how to deliver the circumstances most likely to deliver meritocracy is another matter entirely. When it comes to school reform, the movement with greatest momentum currently is dedicated to school choice and the uses of market based forces to improve the opportunities for students enrolled in public education. School systems across the country, where possible, have changed the ways in which students enroll in schools to deemphasize reliance upon zoned schools within geographic boundaries and to have public schools seek out students across those zoned districts. Various instantiations of voucher programs encourage parents to seek out even nonpublic schools that will be subsidized with public money. Straying far from their original conception as temporary laboratories for experimentation on behalf of the most difficult to teach students, charter schools operate in direct competition with district zoned schools and many have become brands unto themselves, aggressively expanding operations. These ideas originated some decades previously with free market economists like Milton Friedman who in 1955 openly advocated for public education to more closely resemble markets for goods and services that have driven consumer innovation in the past two centuries. Intellectually, they gained support from the work of John E. Chubb of the Brookings Institution and Terry Moe of Stanford University in their 1990 book entitled “Politics, Markets and America’s Schools” where they concluded that the most important predictor of a school’s success was the locus of control between traditional school boards and privately controlled schools. Their prescription included the creation of school choice districts where schools would have to compete with each other to attract and retain students. Despite the omissions from Chubb and Moe’s work, such ideas found powerful patrons among conservative politicians who enthusiastically advocated for school choice and voucher programs as the solution to the school failure narrative that took root with the release of “A Nation At Risk” during the Reagan Administration. While originating with conservatives, school choice became a growing theme among Democrats in both the Clinton and Obama administrations and for Democratic governors across the country. Although less likely to support vouchers that take public school budgets and transfer them to entirely private entities, the growth of charter schools and support among Democratic politicians represents a strong toehold for choice as an engine of reform on both sides of the political aisle. Choice, in various forms, is recognized as the powerful driver of improvement and innovation across the mainstream political spectrum. The question is far less clear than advocates would have us believe. Markets are, undeniably, a powerful tool for innovation, but whether or not that does or can apply to public education is quite a different matter. It is important to consider the ways in which markets work. As a matter of record, I am not an economist, but what follows is not controversial ground. Most markets for goods and services function by supplying the market with a range of innovative products, yes, but also a range of similar products that are available at different levels of quality and expense. Many people, wealthy, middle class and working class, can afford to purchase personal transportation because the market that provides vehicles such as the Rolls Royce Phantom also provides the Ford Focus and used Honda Civics. The individual in need of an automobile can usually, within a relatively short distance from him or herself, find an option that takes into account both the need for the good AND the ability of the buyer to go above the most basic fulfillment of the need. Markets are exceptionally efficient at doing this, so while every person participating in the market may not be able to afford the best it has to offer, most people can find something. But what about where everyone needs the same thing? In the picture on the left, all three people have an absolutely equal playing field, but only two of them can achieve the goal of watching the baseball game. With some minor tinkering, however, the third member of the group can achieve that goal because his specific needs have been accommodated without taking away anyone else’s opportunity to enjoy the game. 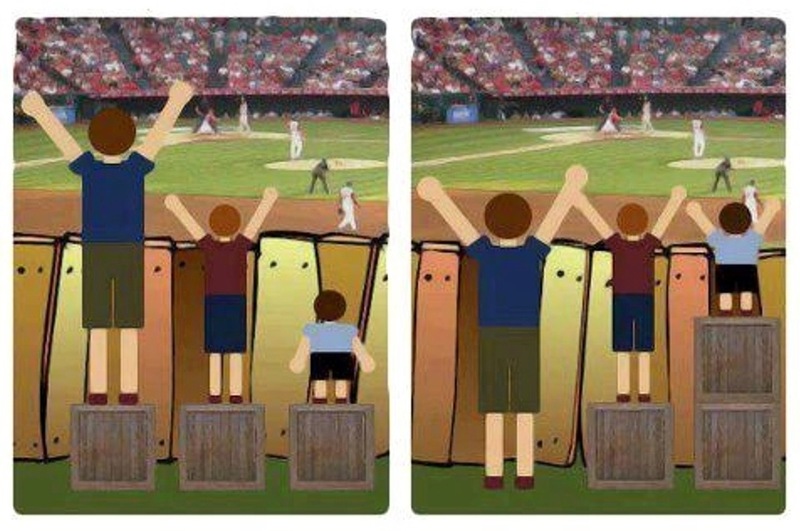 In an educational context, this is the why equal is not always the appropriate circumstance when a student is fully capable of accomplishing a task but needs individualized attention. This sounds like an argument then for the market based and competitive goals of educational choice and policies that break down district zoning in assigning a student to a school, and I can understand that. After all, if individualized attention is a key to promoting equity, it would make intuitive sense for more choices to provide more setting where that is possible. However, I am drawn again the observation that market innovation is powerful when it is providing different levels of quality for the consumer. Innovation and competition has made many kinds of good available to all consumers, but nobody can honestly argue that all such good are of similar quality and durability. The same observation applies to services provided as well where consumers able to pay more enjoy levels of amenities not provided to those who do not. But we demand very different from our compulsory education. There is no “used Honda Civic” or “economy class seating” when it comes to teaching a child how to read, and providing equitable opportunities means that education “consumers” sometimes need to utilize MORE resources regardless of their ability to pay. In order for a market system of schooling to really provide for equitable opportunities, several conditions seem extremely important. First, the number of choices available would have to be sufficient to the task of every family having a genuine ability to enroll in a school or schools that meet their needs. Even in major metropolitan areas, this is unlikely as a selection of schools cannot simply be packed onto a display wall like a selection of shoes, and after a certain point, families would incur unacceptable costs simply to transport their children to the array of schools they need. Second, families would have to be equally engaged and knowledgeable about what children need and how to evaluate the claims of different schools about their accomplishments. That also seems doubtful because when one makes a mistaken choice in typical markets for goods and services, there are options for returning or foregoing use of the item which does not exist when it comes to schools. Certainly, the high turnover rates among many of the more prominent charter school operators suggests that even in a limited market, families seek out schools that are either “poor fits” for their children or that are unwilling to adjust themselves to meet the needs of the children they have. Without zoned schools, such children would be at risk of having to “return” their educational opportunity every year. Third, school choices cannot become more stratified than they already are due to income segregation in our communities. In a marketplace, it is fully acceptable to provide consumers in different income strata different quality goods, but this cannot be permitted in education without the system perversely betraying promised opportunities. Finally, a market of educational choices has to demonstrate that it truly provides better outcomes for the vast majority of students, both quantitatively and qualitatively, than a system of zoned schools. To date, such metrics have been extremely elusive in research on both vouchers and charter schools to the point that one can reasonably question just how much more expansion of such ventures is really warranted. Jan Resseger, a former education advocate for the United Church of Christ, recently noted that one of the primary advocates of the “portfolio” strategy of school choice, a mix of zoned schools and choice options promoted by the Center on Reinventing Pubic Education at the University of Washington, had recently admitted that troubling outcomes in many districts that have tried the strategy. While Ms. Lake did not suggest the cycle of disruption was actually failing to improve education for the most vulnerable, the CRPE report levels heavy criticism at the way such reforms have been implemented without strict oversight to ensure all students have excellent school choices. What is missing is an admission that market based forces are not necessarily the way to improve our national commons which includes compulsory education. So what does this mean? My own suggestions center around reemphasizing public education as a common good for society, and bringing our emphasis back to improving zoned schools. This would require renewed interest in fully funding schools regardless of their needs and improving curricula and teaching locally, a major campaign to improve the infrastructure of zoned schools that still enroll a vast majority of our children, and efforts to invigorate school and community ties by deeper connections to civic organizations and the placement of community services within schools themselves to broaden the number of people who see the school as essential to their neighborhoods. However, as Berliner notes, the accountability for alleviating poverty has to be two directional, and we as a society need to admit that we cannot place the entire burden of children climbing out of inter-generational poverty within communities whose economic prospects are dismal at best entirely upon the backs of teachers and schools. As long as we continue to pass that buck and believe that the same economic forces that allow us a wide and varied choice of breakfast cereals are equipped to provide excellent schools for everyone we will continue to be disappointed.